Fixed Star Alcyone, Eta Tauri, is a 2.9 magnitude greenish yellow star and the brightest in the Pleiades star cluster of the Bull, Taurus Constellation. The Pleiades, or Seven Sisters, are located in the Shoulder of the Bull. The traditional name Alcyone comes the mythological daughter of Atlas, Alcyone. She is the Central One or Hen of the Pleiades sisters who was seduced by Poseidon. The Lascaux Bulls Panorama above shows the The Pleiades constellation accurately represented in its relative position in the sky over the bull’s shoulder. 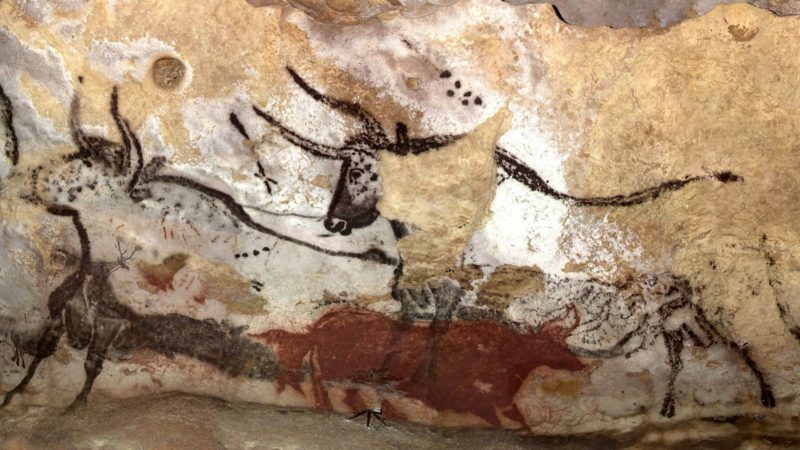 It was painted around 17,000 years ago. 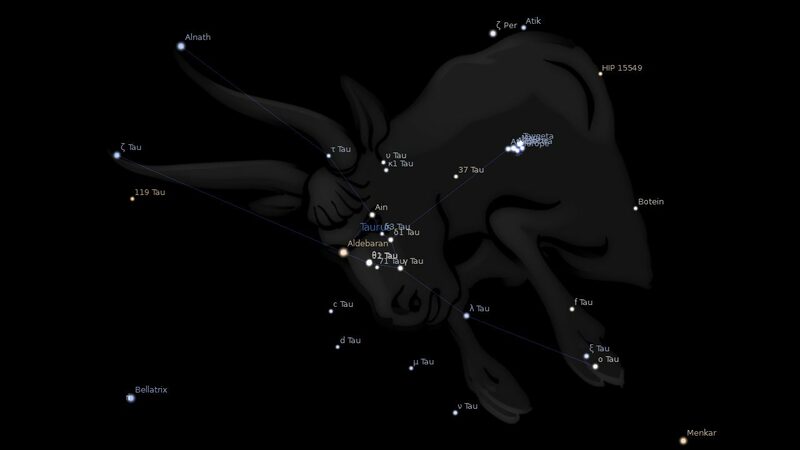 Fixed Star Alcyone causes love, eminence, blindness from fevers, small pox, and accidents to the face. The Pleiades are of the nature of the Moon and Mars. They are said to make their natives wanton, ambitious, turbulent, optimistic and peaceful; to give many journeys and voyages, success in agriculture and through active intelligence; and to cause blindness, disgrace and a violent death. Their influence is distinctly evil and there is no astrological warrant for the oft-quoted passage Job (xxxviii. 31) “Canst thou bind the sweet influences of Pleiades…?” which is probably a mistranslation. Alcyone is a class B star and of the nature of Jupiter in our scheme. It is noteworthy that all the stars of the Pleiades are also of spectral class B. Is it any wonder that Ptolemy claimed this group as having the nature of both the Moon and Jupiter ? While the Pleiades have a generally good reputation during that time of the year when they are hidden by the Sun’s rays (approximately 40 days), they can be of great harm to mankind. At this time, with other correlative indications in the chart, they can occasion the death of a great number of people. Alcyone as representative of all Pleiades is given a larger orb than is usual. 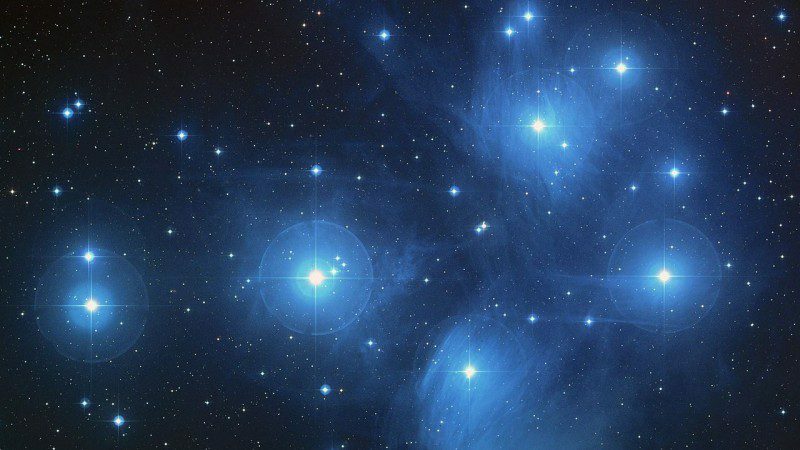 The Pleiades correspond in their influence to a combination of Moon and Mars. If well-connected otherwise, this points to ambition and endeavor, which have as their result preferment, honor and glory. The power of Mars is good in raising people to high position. However, with other relevant planetary connections, this can make for high passion and ruthlessness. The best example here is Stalin. Alcyone, Pluto and Algol are in conjunction in his nativity. Unfavorable connections bring the danger of enmity and fall from power. It is doubtful if any other small star group has had so much written about it as the famed ‘Seven Sisters’. Not one culture anywhere on Earth has failed to make an important celestial station of them, and always with feminine connotation. Alcyone, η Tauri, and the whole Pleiades group, is noted in astrology for its association with deep sorrows and tragedies, bereavements showing strongly with this star. Its position by longitude soon after Algol in Perseus may account for the gloomy quality, since Algol is much connotative with violent death in mundane astrology, and that of course means bereavement for someone else. 1. Fixed Stars and Constellations in Astrology, Vivian E. Robson, 1923, p.119, 182. 3. Fixed Stars and Their Interpretation, Elsbeth Ebertin, 1971, p.17. 4. The Living Stars, Dr. Eric Morse, 1988, p.38. 5. The Fixed Star Health and Behavior Imbalance, Ted George and Barbara Parker, 1985, p.22. See what Eric Morse says  The modern interpretations are not as harsh. Omg – one of my ex’s has this star conjunct his Sun – this is him! Spot on with liking to be well dressed, the luxury, drinking too much and I believed him to be a “closet gay” to be honest! Or bisexual – I’ll most likely never know?! Omg..same here..my old flame born May 22 1976.Drinks too much, and closet gay/bisexual tendencies.Scandals galore, always the subject of some sort of gossip.Bankruptcy, imprisonment and trouble thru children.10th house Sun so publicly well known reputation for being all these things.Crikey! I get a little freaked out because my midheaven is at 01 gemini, thus conjunct Alcyone. And my north node is at 25 taurus, thus conjunct Caput Algol. there is no astrological warrant for the oft-quoted passage Job (xxxviii. 31) “Canst thou bind the sweet influences of Pleiades…?” which is probably a mistranslation. What does it mean when South Node conjunct Alcyone? What is the origin of the glyphs/images included in these pages? I have this Alcyone glyph tattooed on me, didn’t put much thought into it, I found the image on the internet somewhere, knew it was associated with the Pleiades and thought it looked cool. Turns out, I have Alcyone conjunct my sun (28 degrees Taurus). Freaky!